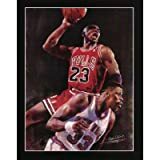 Michael Jordan posters are the never forgotten shots captured on posters of Mike’s most memorable moves like the slam dunk from the free throw line or the game winning shot to overcome the Utah Jazz in the NBA Finals. 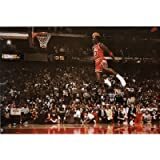 This poster is in new condition and has never been hung, used or displyed. The poster comes pre-rolled in a plastic sleeve.